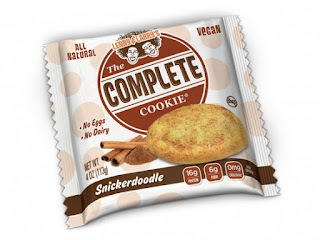 (1) Lenny & Larry's Complete Cookie®. 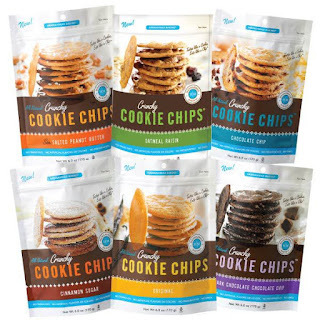 I recently tried the entire line of Lenny & Larry's all-natural Complete Cookies®. These cookies are vegan, but you don't have to be vegan to enjoy them! Each cookie is HUGE, but they contain no preservatives, trans fats, dairy, or animal products. What they do have is 16 grams of protein and 6 grams of healthy fiber. There are seven great flavors to choose from: Chocolate Chip, Double Chocolate, Lemon Poppy Seed, Pumpkin Spice, Oatmeal Raisin, Peanut Butter, White Chocolate Macadamia. They're all moist and delicious, but my two personal favorites are Snickerdoodle and Pumpkin Spice. I love to take one take one Complete Cookie® to work with me. I enjoy half with some yogurt at my desk for breakfast. I save the other half to enjoy with some fruit for an afternoon snack. To find these fun cookies near you, visit Lenny & Larry's Store Locator. (2) DOLE Endless Summer Salad Kit. 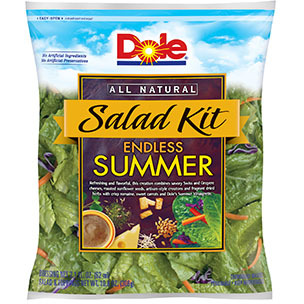 The calendar says Summer is nearing an end...but you can hold onto the flavors of Summer with Dole's fun Endless Summer Salad Kit. This kit has everything you need to whip up a quick salad to serve on the busiest of weeknights. The kit contains Romaine lettuce, crunchy red cabbage, and carrots. It also comes packaged with lots of other fun goodies: DOLE's sweet-tart Summer Vinaigrette, Swiss and Gruyere cheese, roasted sunflower seeds, artisan croutons, and a packet of herb seasoning. The combination of flavors and textures is so refreshing -- just like Summer. I like to add some sliced organic strawberries before tossing for a perfect side dish for grilled chicken breast. Next time, I plan to add mandarin oranges and grilled shrimp to this versatile salad kit for a refreshing main dish salad. (3) POM Wonderful's POM Tea. On hot afternoons, I like to keep well hydrated. 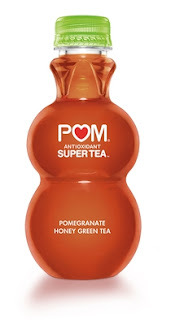 One of the best new beverages that I've tried recently is POM Wonderful's POM yummy line of teas. These refreshing beverages combine the antioxidant benefits of pomegranate juice with a variety of teas. There are four flavors of POM antioxidant super teas to choose from: Pomegranate Peach Passion White Tea, Pomegranate Lemonade Tea, Pomegranate Sweet Tea, and Pomegranate Honey Green Tea. All four flavors are lightly sweet and very hydrating. Michael and I enjoyed trying them all. His favorite was the sweet-tart Pomegranate Lemonade Tea. My personal favorite is the Pomegranate Honey Green Tea. Each 12-ounce container has 130 calories and 22% of your daily requirement of Vitamin C. All of the teas are smooth and very easy to drink. To find these POM Teas near you, be sure to visit POM's Store Locator. (4) Acala Farms' Infused Cottonseed Oil. Acala's amazing line of flavor-infused cottonseed oil is really fun to have on hand in your kitchen. These versatile oils can be used to saute, add to marinades, or even as a bread dip. If you've never cooked with cottonseed oil, you should definitely give it a try! It's naturally heart-healthy, and it has a lightly clean flavor. It's perfect for cooking, because it also has a very high smoking point. I've tried two flavors so far: Fresh Roasted Garlic and Fried Shallot. I made some excellent pan-seared chicken with the Roasted Garlic flavor. It's also excellent as a bread dip -- simply add some salt, pepper flakes, and a chiffonade of fresh basil and serve alongside a loaf of warm bread. 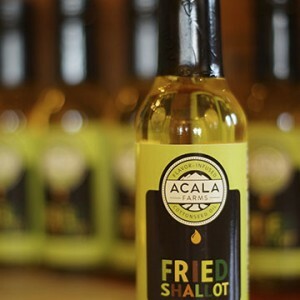 To try Acala Farms' infused cottonseed oil for yourself, simply visit their online store. (5) HannahMax Bakery Cookie Chips. If you like your cookies crunchy, these Cookie Chips are the perfect snack for you! Their tagline, "Tastes like a cookie, Eats like a chip" is very appropriate! These Cookie Chips are buttery, crispy...and downright addictive. They come in six great flavors: Original, Chocolate Chip, Dark Chocolate Chocolate Chip, Cinnamon Sugar, Sea Salted Peanut Butter, and Oatmeal Raisin. I love them all, but I have to admit that I'm partial to the Sea Salted Peanut Butter. Each bite is buttery and sweet, with a light salty punch. Each 5-cookie serving has 130 calories and 6 grams of fat. Hint: They're also great crumbled over a bowl of ice cream! Cookie Chips can be purchased via their online store, and they also offer a convenient Store Locator. 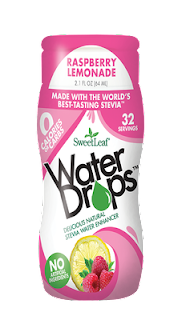 (6) SweetLeaf® Water Drops™. We all know that it's important to drink plenty of water each day to stay properly hydrated. That said, plain water can get a bit...boring? To make drinking water fun, I love to add flavor enhancers. I recently tried SweetLeaf® Water Drops™, which are flavored with all-natural stevia. You can choose from four fruity flavors: Lemon Lime, Raspberry Lemonade, Peach Mango, and Strawberry Kiwi. These drops contain no artificial colors, and they add no calories or carbohydrates to your water. What they do add is tons of flavor! My personal favorite is the Lemon Lime, and I add a wedge of lemon or lime to add a bit of tartness. Because these SweetLeaf® Water Drops™ are not colored like typical water enhancers, add a few drops at a time and taste to ensure you add the perfect amount of flavor! Visit their convenient Store Locator to find these water drops near you. 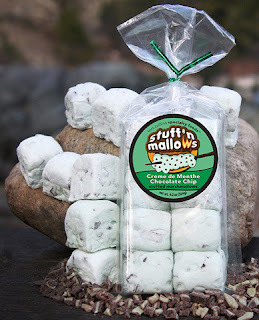 (7) Stuff'n Mallows. Do you love s'mores but wish there was an easier way to make them? Then, you've got to try Stuff'n Mallows. This fun item combines pillowy artisan marshmallows with tiny chocolate chips. Simply microwave the Stuff'n Mallows for 10-15 seconds -- or toast them over a fire until they're perfectly toasted. Then, sandwich between your favorite cracker or cookie. Voila -- s'mores! Stuff'n Mallows come in a trio of fun flavors: traditional Chocolate Chip, Peanut Butter Chocolate Chip, and Mint Chocolate Chip. For instant gratification, I heated Chocolate Chip Stuff'n Mallows in the microwave for 15 seconds, then sandwiched between vanilla wafers. The marshmallow was gooey, and the bits of chocolate perfectly melted into pockets of chocolate inside. To try these fun chocolate-studded marshmallows yourself, simply visit their convenient Online Store. (8) Intensity Academy's Honey Hype Spice. I'm a sucker for fun spice blends! They add an extra layer of flavor to a wide range of dishes. 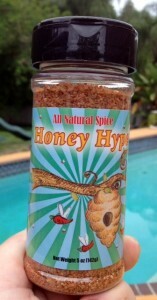 One of the best spice blends I've tasted in ages is Intensity Academy's sweetly spicy Honey Hype Spice. This seasoning blend contains crystallized honey, salt, spices, and sugars. Honey Hype tastes sweet at first, then the warm spices kick in. Based on Intensity Academy Founder Michele Northrup's recommendation, I love using Honey Hype on roasted vegetables -- especially cauliflower or broccoli. I toss the veggies in a bit of olive oil, spread on a cookie sheet, and sprinkle with Honey Hype before roasting in a 425-degree oven. Honey Hype is also fantastic sprinkled on top of a green salad with strawberries added. The next thing I want to try this versatile seasoning on is grilled shrimp! To purchase sweet-spicy Honey Hype, visit Intensity Academy's Online Store. Disclosure: The products featured in this column provided me with sample products to facilitate inclusion. However, all opinions expressed are solely my own.